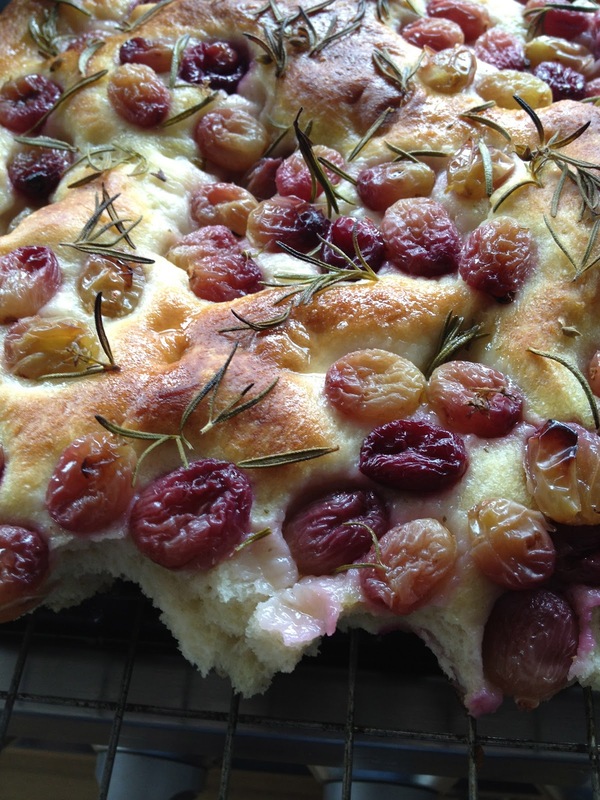 Schiacciata means squashed in Italian, and this is a recipe for a sort of foccaccia bread with grapes squashed into it. It’s not a sourdough recipe, you don’t need a bread maker. It’s really very simple. I have had this recipe for ages, cut out from an Italian magazine and converted into English stuff. It’s an odd bread though. People often say to me things like “oh God I couldn’t make my own bread I’d just spend all day eating it”. Well, I don’t spend all day eating bread. I think this is largely because sourdough (what I usually make every day) is delicious, but satisfying. Even though it’s a sum of parts of water, flour and salt, the way it’s made makes it far more satisfying than bread made with commercial yeast plus those same parts. My partner makes a foccacia that is so addictive I am as bloated as a puffer fish by the end of a meal as I carry on eating it well after my stomach is stretched to fullness. This is an odd bread, however, because what would you eat it with? Well cheese is an obvious one. A salty cheese especially I think (actually, almost any after-dinner type cheese, I just really wanted to write the words ‘salty cheese’). And I think it would be perfectly wonderful with Parma ham. Whatever you have it with, it makes for a very attractive centre piece, would make a lovely present, is easy and quick to make but really needs to be eaten within a day of making it. It’s lovely warm, but not too hot, from the oven. And it’s very hard to resist, so don’t make this if you’ve just gone on a diet (loathsome word). You won’t get a big, airy crumb. This is altogether a more cakey bread. 200-300g red or black seedless grapes, washed and dried, all off the stems. You can easily double up or treble the recipe. I double it usually and make it in a big rectangular tin. But really, that gives you enough for a dinner party and you don’t really want that unless you are actually having a dinner party. And as this bread doesn’t keep I’d keep the quantities modest until such time as you know you’ll be feeding the five thousand. Chop up the rosemary sprigs (take the leaves off the stems) until you have very finely chopped bits, about a tablespoon’s worth. Put in the olive oil in a pan and warm very gently through for a few minutes. Then take it off the heat and let it cool and infuse. You want it to be back down to kinda blood temperature, honestly as long as it’s not boiling hot you can’t go wrong. Whilst that’s happening, mix the yeast in 90ml of warm water and a scant tsp of the caster sugar (more like half really, kinda like a pinch). Whisk gently and leave for 10 mins until frothy. Maybe longer, but it will have frothed and puffed up a bit. Now add the flour and salt to a bowl, make a well in the middle and then the yeast mixture and half the rosemary oil. Mix together roughly with your hands until you’ve got it mostly together. Leave, covered, for about 8-10 mins. Turn out onto an oiled board and knead for about ten seconds. Leave for 8-10 mins. Turn it out onto an oiled board again and knead for about ten seconds. It should be all nice and smooth now. If not then do it one more time. If it looks good and smooth, cover with a bowl and leave to rise at room temperature for 1-2 hours. Sorry not to be more accurate, but it depends on your room temperature. Until it’s doubled in size. As a guide, my kitchen was at 22C and it took about 90 mins. When you feel it’s ready, oil a suitable oven proof dish – you can use a round cake tin (23/24cm) or a rectangular one. You need something with sides really as you’re going to be brushing it with a lot of oil and you want to keep the oil in the dough, not escaping out onto a baking tray. I sort of squash the bread in, and over about 10 – 15 mins (so the dough is nice and relaxed) I push it out to the sides of the tin so it fills it. You want a thin layer of dough, not thin-crust pizza thin, but about 1-2cm thick. Now squash the grapes in. I say squash but don’t break them, kinda push them in. Brush the bread with the remaining oil. yes it will see like a lot. Now scatter over some more rosemary, sprinkle over some caster sugar (not loads) and set aside for about half an hour, covered with cling film or a very wrung out damp teatowel. In the meantime preheat the oven to 250 (or as high as it will go if not as high as that). Bake for about 10-12 mins, then turn down to 220 for a further ten mins or so. It’s done when it’s golden brown. Cooked and heavily nibbled by someone. 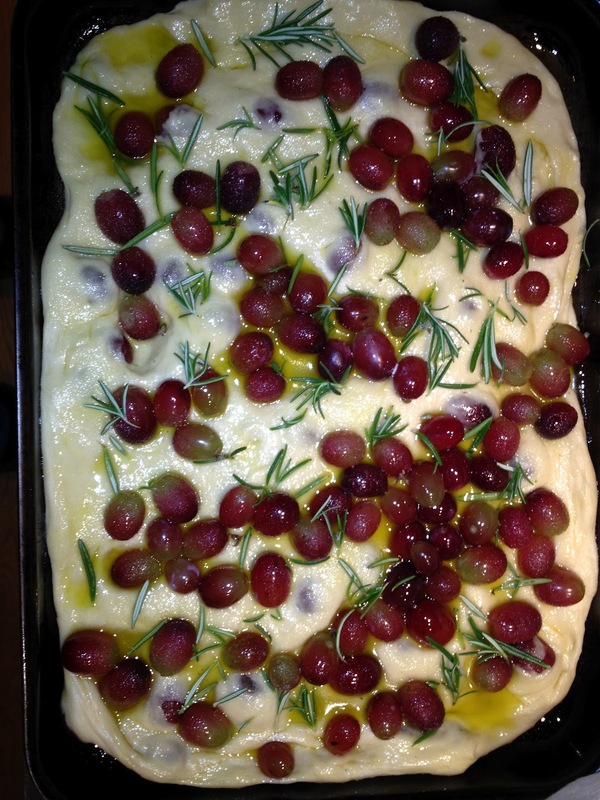 This entry was posted in Bread and tagged bread, grapes, schiacciata on June 13, 2012 by Annalisa Barbieri. This is so delicious that I started eating it and then remembered I hadn’t photographed it which is why it’s half eaten. But it looks very good when first assembled and will appeal to those who like prettiness on a plate. If I had tons of money, one of the things I’d do is hire a chef. Someone to make wonderful little delicate salads for me. I love salads. I’m not talking limp lettuce with enough vinegar to make your hair shine, I’m talking big, blousey salads with lotsa things in them. The problem is I don’t always feel like making them. Since my first pregnancy, sometimes preparing a salad can make me feel a bit sick. I have to do it before hunger makes me stupid, so a bit of pre-planning is required. I’m hugely fortunate, but utterly deserving, because my partner is a fantastic cook, and I can sometimes boss him into making me a delicious salad, giving him the above reason/excuse and it seems to work. 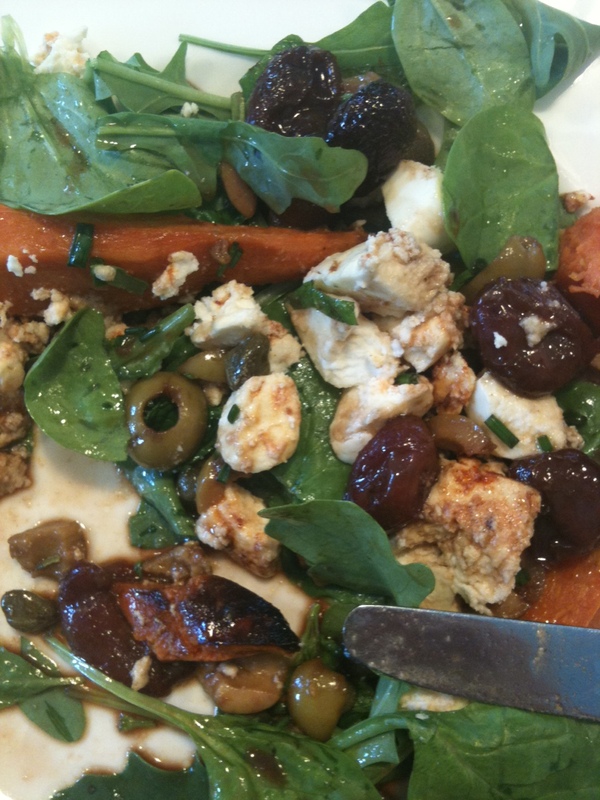 Despite me telling you all this, I’ve got quite a salad repertoire and this is one of them. It’s from Peter Gordon’s Salads. I think Gordon (The Sugar Club, The Providores) is hugely underrated by the at-home cook. I love Salads – published in 2005 – because Gordon proves that a proper salad can be a meal in its own right, not just an add-on to lessen the guilt. The recipe below can withstand a lot of tweaking, so if as you make it you think “I can’t possibly eat this much spinach” then don’t put so much in. I found 400g waaaaay too much and only used about 150g. Don’t know if it’s a typo but see how you get on. I’ve reproduced the recipe here the way he printed it however. 300g grapes off the stems. He doesn’t specify which, I used red seedless. You’d be insane to use seeded ones unless you want your guests to be spitting all over lunch. First you preheat the oven to 180. Line a baking tray with baking parchment and then slice the ricotta into 2cm pieces. Don’t worry if it crumbles a bit. I sliced mine whilst still in its little round container, and then lifted it out, and it worked fine. Mix the paprika, cumin and cinnamon together with a teaspoon of the olive oil and brush this on the cheese. Sprinkle with sea salt and cook for 15 mins. Take out and leave to one side to cool. Turn the oven up to 200C. You’re now going to cook the sweet potatoes and grapes together, so pick two containers that will fit side by side. If you don’t have, don’t fret. This salad is served at room temperature so you can just cook one at a time. I’d probably do the grapes first. So, cut the sweet pots into thin wedges and place in a small roasting tin. Pour in the hot water, season with salt and pepper and drizzle over the remaining olive oil. I know it sounds mad but just do it. Bake until just cooked – about 20 mins. Place the grapes in a non-reactive dish and pour on the pomegranate molasses, grapeseed/other oil you’re using and soy sauce. Bake for 20 mins. Remove when done and leave to cool. Once everything is at room temperature, pour the juice from the cooked grapes into a bowl and mix in the olives, capers, mint and chives to form the dressing. To serve, toss the spinach with half the dressing and place on four plates. Scatter the sweet potato wedges on top, then flake the ricotta on top of that. Scatter over the grapes then pour the rest of the dressing over the top. Eat. You will enjoy it. This entry was posted in What's for lunch? and tagged grapes, ricotta, sweet potatoes on June 14, 2011 by Annalisa Barbieri.